Maryland Dutch Shepherd Rescue View other Dutch Shepherds for adoption. 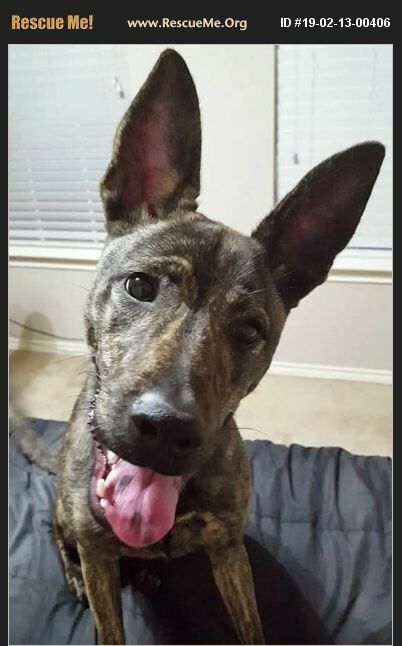 Bentley is a beautiful 10-month old petite brindle Dutch Shepherd and Carolina mix. She is such a very sweet girl. A true little love bug. Bentley is crate trained and house-trained. She is cat- and dog-friendly. She enjoys being around children and meet new people. She is an adorable cuddle bug and social butterfly. Bentley's has the most beautiful warm and soulful eyes. Her soft coat is medium-length in the most beautiful brindle color. She has the most adorable spotted tongue as she got into the blueberries. And oh those ears won't miss a thing. She is super-alert to her environment and will let you know if there is someone outside that doesn't belong there. Bentley likes going on long walks. She would possibly make an awesome running partner to someone, or be a companion for hikes on weekends. She wouldn't even mind sharing a tent while camping and keeping her sharp ears out for any intruders. She loves spending time outdoors with her humans, so she is fair-game with any fun activities. If you toss her balls, she will fetch them. Maybe you can teach her how to fetch a frisbee! Bentley is a real good girl. Nothing she would want more than finding her own loving home with people that will love and care for her. She in return will be a very loyal dog to her human or family and shower them with love. Bentley was adopted from a Houston shelter when she was just a little puppy. But then found herself back at the shelter again only months later because the owner just didn't have the time for her. Bentley is currently in foster care. Bentley is spayed, micro-chipped, up to date on all vaccines, on heartworm and flea prevention. If interested in our pretty girl Bentley, please send an email to NeedfulSoulsDogRescue@gmail.com to request an adoption application.